Photo(s) by Carly SimpsonErnest Hemingway portrait alongside the Radio Centre II building on Park Street. And that got Welch thinking about hanging art all over Traverse City. So he started pounding the pavement looking for support for his idea. He soon found it in enthusiastic building owners, from the Dennos Museum, a cadre of art supporters and–as always–Britten Banner. The most recent installation (in December 2015) is on the Radio Centre II building on Park Street. It is an enormous print of the famous Yousuf Karsh photographic portrait of Ernest Hemingway taken in 1957. It looks amazing–and very fitting given Hemingway’s roots in Northern Michigan. The new outdoor art display emerged in Traverse City inspired, in part, by Grand Rapids ArtPrize, and initiated by local artist Paul Welch. 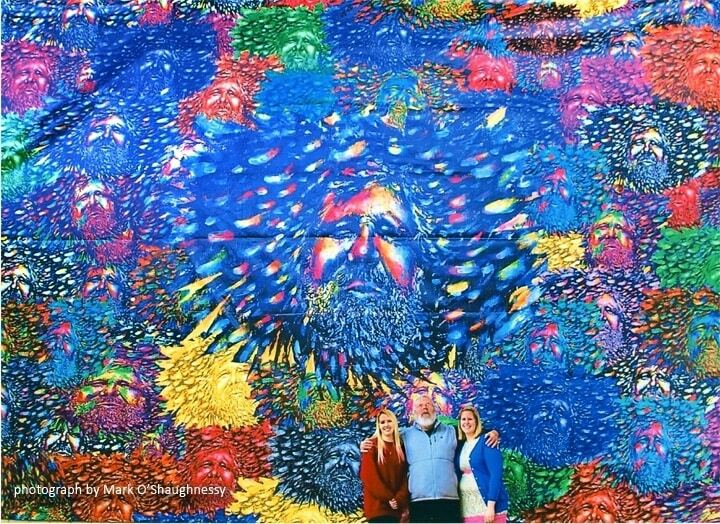 “The worlds biggest selfie,” is the way Welch described the 18-by-24 foot print of his self portrait collage, Face to Face. 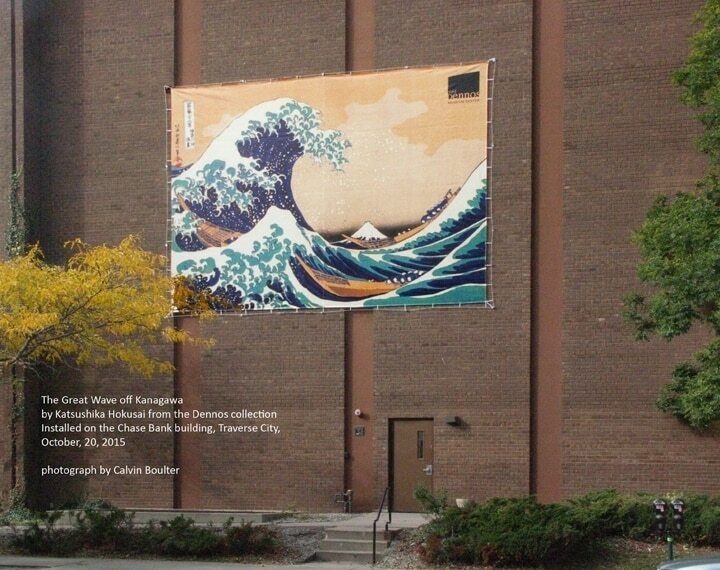 The print, first displayed at the 2013 Grand Rapids ArtPrize, was designed in collaboration with and printed and installed by Britten Banner of Traverse City, Michigan. In 2014 Welch made a second mammoth print, Bike Collage, for ArtPrize. After ArtPrize Welch now had two canvasses he didn’t know what to do with. 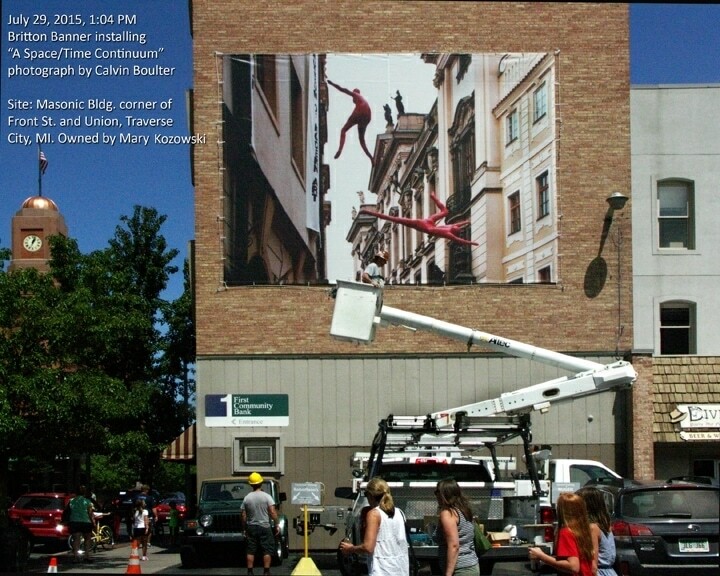 “They could hang on an outdoor wall,” he said, “to promote visual art to the residents and visitors of Traverse City.” Welch proceeded to promote his inspiration. 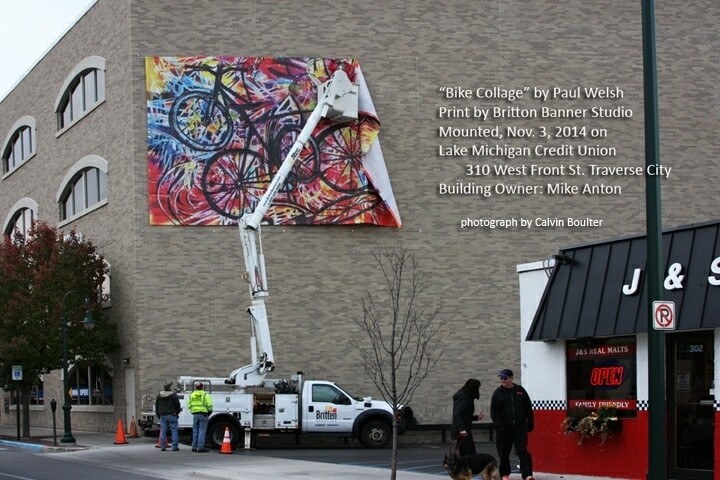 Mike Anton said he’d love to have Bike Collage on the wall of his building at 310 West Front Street facing J&S Hamburg. Paul Britten graciously agreed to help and installed anchors and cable and mounted the canvass in November, 2014. Meanwhile a consortium of supporters formed to advance the idea of finding more buildings to decorate and try to find ways and means to fund the project. 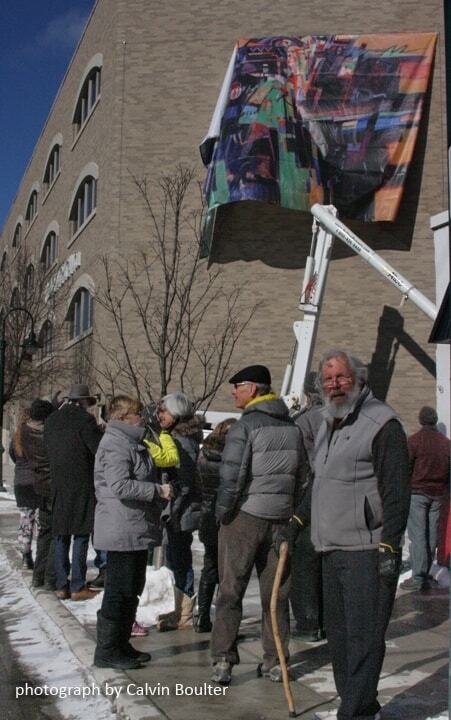 Charles Murphy next agreed to have one of his watercolor pieces reproduced by Britten Banner, and in March 2015, it replaced Welch’s piece on the side wall of Lake Michigan Credit Union. While that installation was under way, van loads of school youth arrived to watch. Welch, ever the inspired arts promoter, gave an impromptu street lecture in the sunny but windy cold. Following the Murphy installation came “A Space Time Continuum” by me, Calvin Boulter, on the Masonic Building at the corner of Front and Union and Copper Thunderbird by native Canadian artist Norval Morrisseau, from the Dennos Museum collection on the alley side of 148 E. Front (the building that houses Talbot’s). Next came “The Great Wave off Kanagawa,” a print of the famous woodblock print by the Japanese artist Hokusai. Future exhibits are planned that will feature the works of local artists, reproductions from the Dennos museum inventory, selected works of NMC art students and famous works of international artists that are in the public domain.